It is easy to come up with associations when looking at Annie Halliday’s photograms. Her images of bottles, jugs and glasses are not only revelations of material structure, but also like so many other things: spiders webs, birds, the muscular back of a slug, amoebae, x-rays, ectoplasm, the list could go on. This is no accident. The titles of her work often encourage alternative ways of reading the dark traces of light that compose the negative vision of her photograms. Halliday is both scientist and day-dreamer. As if under a microscope, the traces left by objects are isolated so that we may study the way light behaved as it struck them. At the same time, the vibrant, abstract patterns formed by these traces are carefully arranged into designs that may tempt the mind away into more reflective ways of thinking. Halliday has written of the desire to make images that ‘hold rich psychological implications’ and operate as ‘a semi abstract symbolic language’. Signs have been a recurrent motif in her work. In la fenetre, alphabet letter and symbols, drawn into condensation covered surfaces, weep themselves away. 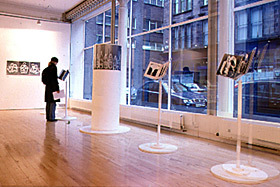 Through this use of ephemeral signs, Halliday intimates that her photograms are, themselves, the strange visual signs, or traces, of a presence that has disappeared: ‘An essential characteristic of the photogram is its strong sense of witness: the subject was there, adjacent to the paper during the event, but is gone’. Roland Barthes stated in Camera Lucida that all photography is a ‘figuration…beneath which we see the dead’, but the photogram, which registers an absence, makes this ghostliness conspicuous. In this context, Halliday’s obsessive exploration of the translucent qualities of various containers offers itself as a metaphor for the impossible desire to capture the essence of existence. There is a strong sculptural element to Halliday’s work. 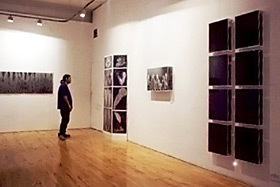 A number of pieces are concerned with making touch visible. Looking at In the dark, we see and sense the pressure with which a figure has pressed against a surface. 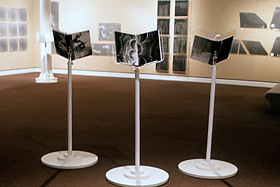 The three dimensional screen on which the image is mounted helps create the sensation that this figure is trying to break out of a void in which it has been encased. But the overall mood of Halliday’s work is neither sinister nor desperate. It constitutes a celebratory aesthetic of disappearance: something to wonder over, not to fear. Halliday’s minimalist arrangements offer the simple pleasure of identifying differences between the shapes objects cast of themselves, and also create a suitable visual quietness within which the relationship between image, source and process may be puzzled over.